Spring has finally arrived in Scotland. To celebrate, the Scottish Friendly Children’s Book Tour is heading up to The Highlands with the fantastic author and illustrator Sarah McIntyre. To celebrate Sarah’s upcoming tour we are giving away a signed and dedicated copy of her latest madcap adventure Pugs Of The Frozen North. What is the official word used to describe a group of Pugs together? The closing date is Thursday 12 May. To enter please add your answer as a comment below along with your name, who you would like the book to be dedicated to and email address. View full terms and conditions here. Born in Seattle, Sarah studied Russian Literature before becoming a writer and illustrator. She now makes picture books, chapter books and comics and her quirky drawing style has won her young fans around the world. Guaranteed to be brilliant fun, Sarah’s school events are packed with drawing, games, stories and amazing costumes – the children of The Highlands are in for a treat! Sarah works at a studio in an old police station in Deptford, South London, which they call The Fleece Station because they started out all making comics about sheep. Her comic Vern and Lettuce appeared weekly in The Guardian and it went on to win the Leeds Graphic Novel Award. Sarah’s latest three books including Pugs of the Frozen North, are a collaboration with fellow writer, the multi-award winning illustrator Philip Reeve. Sarah’s designs and makes her own costumes to go with her book events. 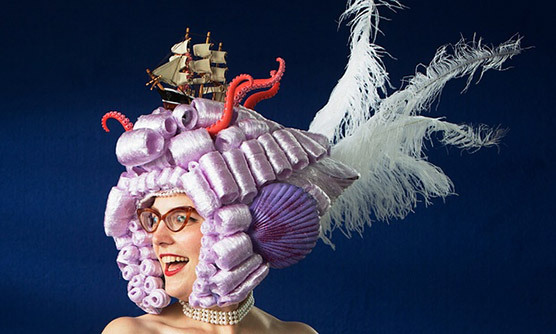 These include mechanical killer cake hats and enormous seawigs using 1400 metres of cling film and wooden model ships! Oliver grew up in a family of explorers – but his biggest adventure is about to begin! Along with his new friends, a grumpy old albatross, a short-sighted mermaid and a friendly island called Cliff, Oliver goes off in search of his missing parents. Immersive, richly textured and enormous fun.